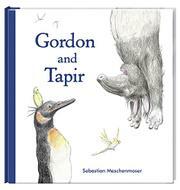 Gordon and Tapir discover that friendship isn’t enough to find common ground. Meschenmoser’s pals are about as odd a couple as an herbivore from the tropics and a pescavore from Antarctica can be. Tapir is the kind of guy who leaves the toilet paper roll empty because it is more fun to wear the paper as a turban than to have it handy for other purposes. Gordon, who is a penguin (as opposed to Tapir, who is a tapir), is of the opposite school: a place for everything and everything in its place. Though Gordon may look sharp, he grouses a lot. The floor is sticky with fruit. The sink is full of dishes. And when is that visiting hippo going to vacate the tub? Tapir is far from oblivious, however. What about that stinky fish garbage? What about the exclusivity of Gordon’s colony of friends? Gordon has an answer. He will move out to a spacious, minimalist loft, and Tapir can have the jungle of mess all to himself. That’s cool with Tapir. They can keep in touch by phone, pay each other visits. Is this the best friends can do at finding a solution? That affection can abide only at a distance? Though the final, wordless images hint that may not be true, it will take some work on readers’ parts to arrive at that inference. Lovely artwork—colored-pencil delicate—artless theme.